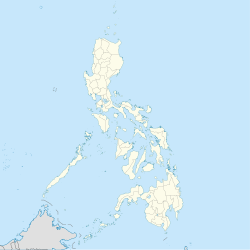 Maluso, officially the Municipality of Maluso, (Tausūg: Lupah Maluso; Chavacano: Municipalidad de Maluso; Tagalog: Bayan ng Maluso), is a 4th class municipality in the province of Basilan, Philippines. According to the 2015 census, it has a population of 40,646 people. On February 27, 2010, about 70 militants of the extremist Abu Sayyaf group attacked Tubigan village in Maluso, setting fire to homes and killing at least 11 people. Maluso is politically subdivided into 20 barangays. In the 2015 census, Maluso had a population of 40,646. The population density was 240 inhabitants per square kilometre (620/sq mi). ^ "Abu Sayyaf militants raid Philippine village". BBC News. 27 February 2010. Archived from the original on 2 March 2010. Retrieved 10 November 2016. ^ "Municipal: Maluso, Basilan". PSGC Interactive. Quezon City, Philippines: Philippine Statistics Authority. Retrieved 8 January 2016. ^ "Maluso, Basilan : Average Temperatures and Rainfall". Meteoblue. Retrieved 29 January 2019. This page was last edited on 24 February 2019, at 09:47 (UTC).